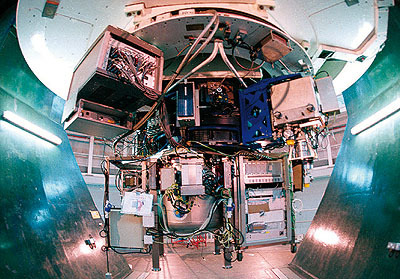 LIRIS (Long-slit Intermediate Resolution Infrared Spectrograph) is a near-IR imager/spectrograph for use at the Cassegrain focus of the 4.2m William Herschel Telescope. It was built and developed at IAC and became a common user instrument at ING. LIRIS uses a 1k×1k HAWAII detector for the 0.8 to 2.5 μm range. The pixel scale is 0.25"/pixel, yielding a field of view of 4.27' x 4.27'. This webpage provides information for the observer at the telescope and for the planning of an observing run. Extensive documentation about more technical aspects of LIRIS can be found at the IAC LIRIS webpage. From semester 2014B, the manufacturing costs of LIRIS MOS masks, must be covered by the home institution of the proposing team. IAC provides the mask design as well as the management of the procurement process. More information about LIRIS MOS mask costs, design and timelines is available in Considerations about LIRIS MOS observations. December 2013: The LIRIS webpages have been reorganised and the old cookbook has been incorporated. If you can't find what you're looking for on this page, the old pages can still be found here. January 16, 2012: New 10" slit available. September 11, 2009: New l0p75ext6 mask is available (currently known as lext6), for increasing the spectral coverage. Jul 20, 2009: Changes in MOS mask preparation regulations; check them here.